This is a new format of face and body art that offers entertainment with visual impact and an element of surprise. 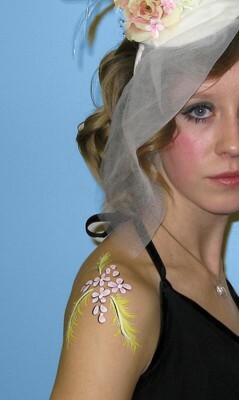 Our face and body artists paint designs on your clients during the event. We can set up in a foyer/bar or in the party. We discuss with the person what they might like and how subtle or dramatic they want to look. Then, we instantly create the design. It can be fantasy make up, a mask for a ball, a tiny flower on a cheek or a trailing design down an arm or back. People can be shy to start with but as they see the designs, everyone wants to be a canvas. Watching the artist at work gets people talking and once people have their piece of art and walk around, it gets more people talking. It lifts people’s mood and brings art and smiles to your event. We use non-smudge, hypoallergenic make-up that can last the whole evening and can be washed off with soap and water. We can set up in a room, foyer/bar before the event starts. Our designs are created to uniquely compliment clothes or jewellery for the individual.